PLANE LANDS UNEXPECTEDLY; 220 EVACUATED. WHY? SOCKS! Alright, this article is not the most important of the week, but it’s probably the funniest. The plane made an unscheduled landing at Myrtle Beach, South Carolina, about ten victims were rushed to the hospital, the remaining 210 or so passengers gathered on the runway and just inside. Finally, around 3:00 am, an evacuation plane became available and it flew the remainder to Fort Lauderdale where they arrived around 5:00 am, about 5 hours after the originally scheduled landing. From there, life went on. 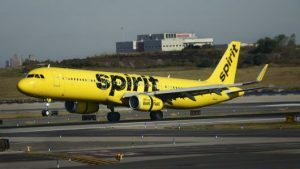 The Spirit Airlines plane was inspected by rescue crews and absolutely nothing was found. With hindsight, it seems likely that dirty socks from a single passenger gave off an awful scent and caused some passengers to sicken and be rushed to the hospital. Yet, things weren’t worse than that. That was the 4:00 am flash, but there was nothing behind it except details about the emergency grounding at Myrtle Beach and the rescue evacuation from there to Fort Lauderdale around 3:00 am. So, much ado about nothing (except dirty socks). Still, the overall scenario is absolutely hilarious.